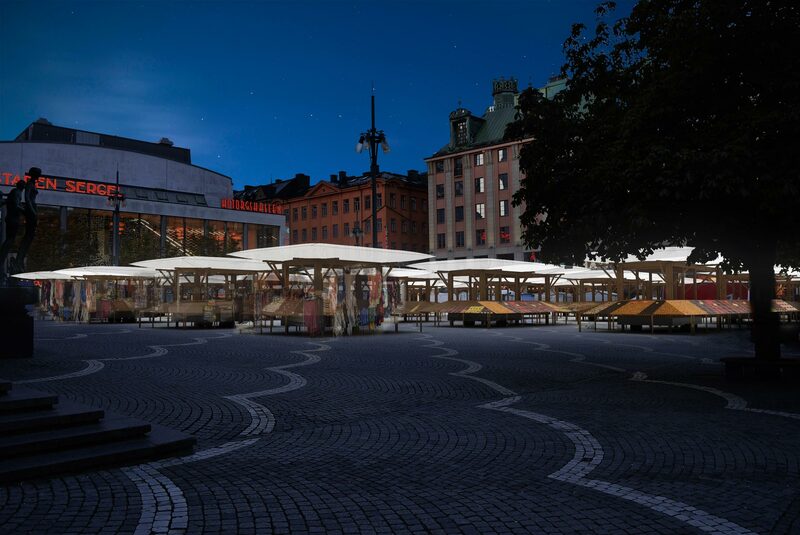 Studio Stockholm Arkitektur was commissioned by the City of Stockholm to review the Hötorget market and its stalls from an architectural perspective. The issue was raised when several of the market’s neighbours filed complaints that the square looked chaotic and messy while the market stalls were perceived as haphazard and unsafe. “We had previously worked with markets on behalf of the Department of Property Management and appreciate that there is a long history around markets to take into consideration, and that the vendors are inventive and tend to solve the various problems that pop up with the carts by using duct tape and rope. 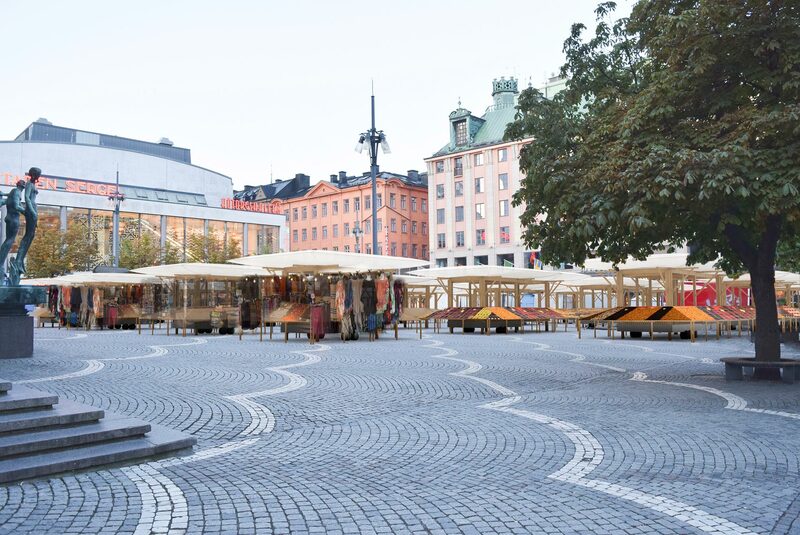 At the same time, the site needs to be presentable and safe for the vendors, citizens, customers and tourists,” says Alessandro Cardinale, Architect and Partner at Studio Stockholm Arkitektur. How then do you create an attractive solution that the users, in this case the market vendors, have not even asked for? Currently, the sales stalls are packed onto large, heavy carts at the end of the day and then rolled down into the garage located below the market square. The garage is going to be renovated and the carts will need to be moved and approved with license plates. Work at the square begins at 6:30 am, when the carts are rolled up out of the garage, followed by tents and trailers. It takes three hours to build the actual stand, which opens for customers at 9:30 am and closes at 5:30 pm. 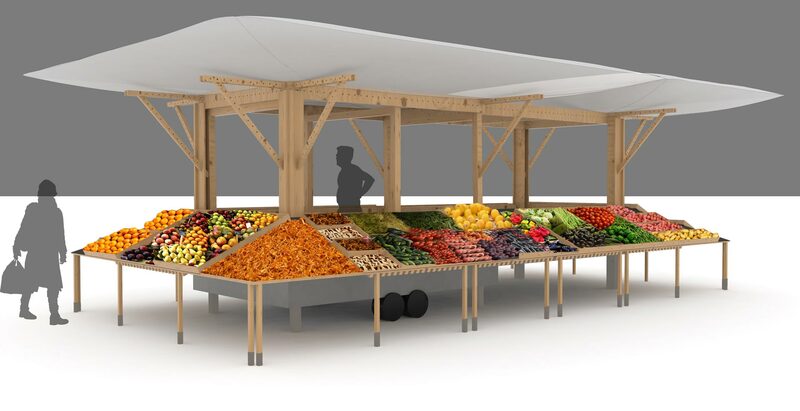 “We found that the market vendors devote almost as much time to packing up and taking down their tents as they spend on selling and realised that if we could offer a simpler and more aesthetically pleasing solution, then both those using the carts as well as their neighbours in the area would benefit from that solution,” says Cardinale. Studio Stockholm had, together with the chairman for the market vendors, scanned the market to see what options were available. 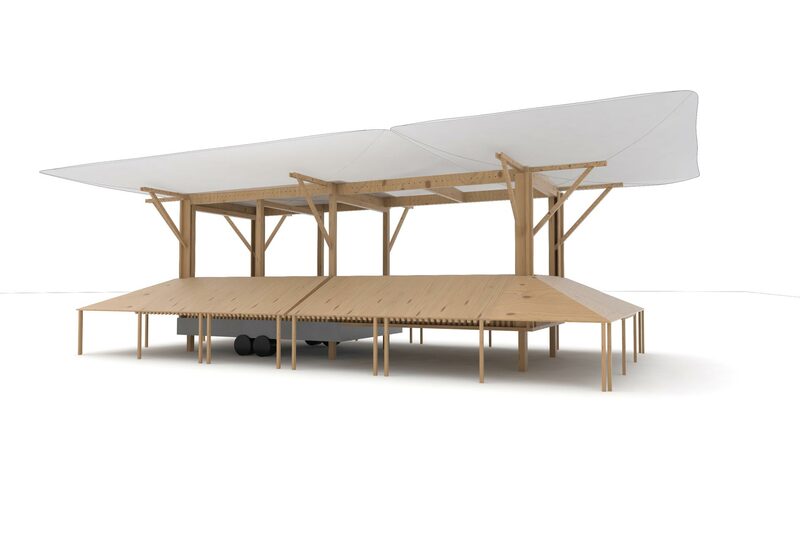 “We studied other industries to try and find alternative carts to use, but there aren’t any good, attractive and effective alternatives so we designed a prototype with an inflatable roof to reduce the weight,” says Cardinale. The roof is a challenge as it is the heaviest part, but through the inflatable solution, the weight of the cart is reduced. Additionally, the roof is illuminated to create the right atmosphere on the square. There are a number of components to take into consideration, such as the foundation, the rules applicable for trailers, and how the compressor should work. 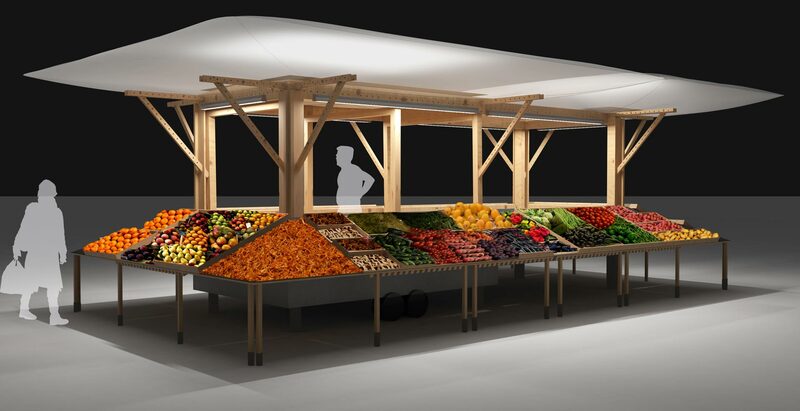 “Our solution is a 10 x 5.5 metre portable market cart that is based on a single system. 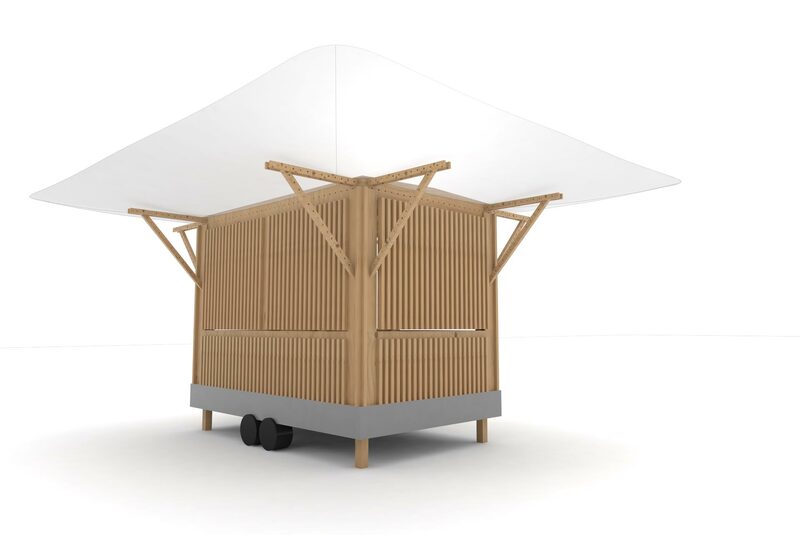 We have created it with Nordic influences in mind and the fact that the cart must be environmentally friendly and therefore sustainable over time. Over the years we have become experts on markets,” Cardinale concludes. The challenges span from the working environment to appearance versus flexibility, as well as safety. The roof of a cart is generally a major challenge due to the large area it is expected to cover and the need for the carts to be easy to pack up and stand firm regardless of the weather. The prototypes have been well received by everyone involved. The next phase of the project is of a political nature – the product is developed and now it’s time to find a way to get the project off the ground. One challenge with the carts themselves has been the weight of the roof, but through the inflatable solution, the weight of the cart is reduced.